Tired and frustrated with workplace stress, in meeting endless deadlines and sales targets, or putting out small fires which takes your time away from more important things in your office or business? Don't worry! You are not alone! 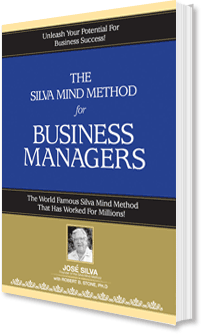 But instead of getting frustrated, be proactive and use The Silva Method Techniques to help you manage and grow your business effectively. Discover how to combine the logical mind with the often-dormant creative side and dramatically improve your powers of concentration, memory and decision making. Learn how to use The Silva Method Techniques to raise your energy levels, communicate better with colleagues and customers, manage time and mental resources more effectively, trigger creative solutions to your toughest problems and increase productivity by reducing work palace stress. Author Jose Silva & Robert Stone, Ph.D.
© Copyright 2004-2019 Silva Method (Malaysia) Sdn. Bhd. All Rights Reserved.